BUKIT LANJAN: Sino-Dream In The Asean Silk Route Quest Dinner sold out! 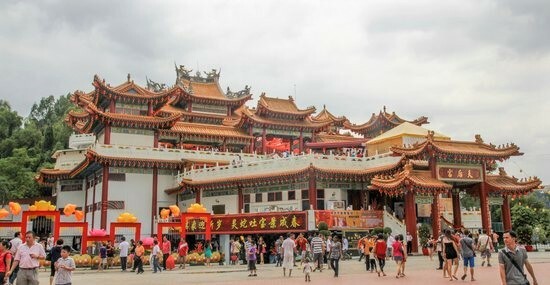 On Saturday May 13, 2017, Kuala Lumpur’s Thean Hou Temple will be filled to the brim with diners occupying 80 tables. At least 800 people, all businessmen and their family members or friends, will dine and be treated to an exclusive variety show titled Sino-Dream In The Asean Silk Route Quest. The dinner is organised by the Malaysia-China Silk Route Business Chamber in conjunction with its maiden inauguration of office bearers, barely a year after the chamber was founded by former MCA president and Transport Minister (Tan Sri) Ong Tee Keat. Ong told Pulse Of Bukit Lanjan that the chamber would be signing collaboration agreements with several chambers of commerce from China. “The role of this chamber is not only to promote commerce and trade between Malaysia and China’s One Belt One Road (OBOR) initiative, it is also actively forging cultural and arts mutually between the two countries. “And we are using the term ‘Sino-Dream’ because the initiative or efforts cover ethnic Chinese from all countries, not only China. “The collaboration signings between the chambers can be considered a historic and pioneering NGO to NGO (non-governmental organisations) initiative or effort. “We hope to help forge greater understanding and ties in all bilateral matters at NGO levels for the mutual benefit of citizens from both countries,” he added. Chinese calligrapher Yan Shan Liy, 47, (right) explaining his “art” piece to Ong. Yan and his entourage had paid a courtesy call on Ong on Friday May 5, 2017. On the sold-out variety show dinner, Ong said the variety troupe from China, named China’s Globetrotters, featured choir and solo performances, live calligraphy and brush painting demonstrations, traditional musical instruments performances and a talk show. “China’s Globetrotters kick-started its overseas tour in 2014 and they are now here (Malaysia) for the first time. We have also been given the honour to organise and coordinate the troupe’s Southeast Asian tour in four other countries - Indonesia (Medan), Laos, Cambodia and Thailand. “The troupe can only perform within two weeks. So, time is limited and we can only cover the four countries. We have thus teamed up with our local network in those countries, and with China, to ensure the success of the tours,” he added. China Globetrotters has to date toured the US, the UK, Russia and Europe. Gerakan Deputy Speaker Syed Abdul Razak Alsagoff said chamber president Ong’s NGO to NGO initiative or efforts to forge closer ties between citizens of both countries “is most commendable”. “I am also told that the transborder chambers’ collaboration involved work and cooperation with entities from China, Taiwan, Hong Kong and Macau, or what is billed as Greater China. “It is a clear and proactive initiative and effort to complement the federal government’s bilateral promotions for Malaysia with China. “Ong has certainly set the pace for various NGOs to consider venturing into transborder activities to enhance their status and nation-building efforts,” said Syed Razak who is also Gerakan’s nominee to contest N.37 Bukit Lanjan in the coming 14th General Election (GE14).